FOR THE ORIGINAL, MARQUEE, & VINTAGE CINEMA LIGHTBOX. 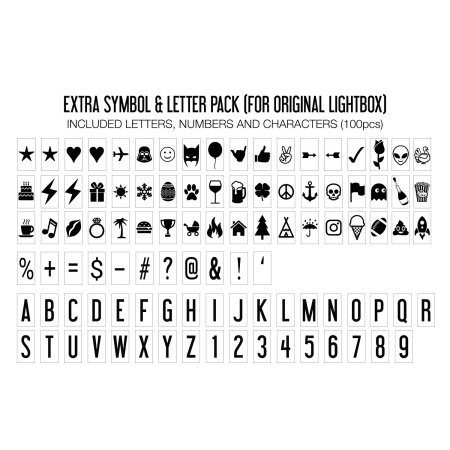 Let your creativity shine with our add-on symbol pack featuring an assortment of fun icons, punctuation marks and a whole alpha numeric set for times when you need an extra letter or number. *Product details: exclusive signature font. 100 symbols, characters, one full set of letters (A-Z) and numbers (1-9). Plus blank tiles to create your own tiles.